The seas are calm. Uncharacteristically so, I’ve been told, not that I mind. 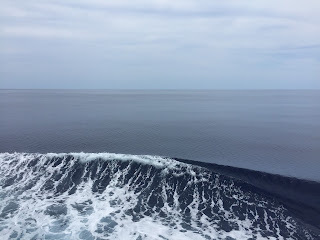 Looking out, the swell is mesmerizing, just this constant undulation of the sea surface. We saw some flying fish scurrying away from the ship. They probably think we are some sort of predator. We think the sight is pretty neat. Then I see a plastic bottle floating by, no note, and sigh. Credit for the photo goes to James Holmes. As calm as it is, the ship is still constantly rocking. The R/V Roger Revelle is large enough that we don’t feel any of the small waves, only the larger, gentler ones. There are two types of motion: roll, the sideways rocking, and pitch, the forward rocking. Spend two minutes on the open seas and you will become well acquainted with them both. Of course, these motions are what cause seasickness. Some people claim to not get seasick, but it is probably always a good idea to bring some dramamine. Being seasick is awful, but there are a couple ways to ease your pain if it does hit you. 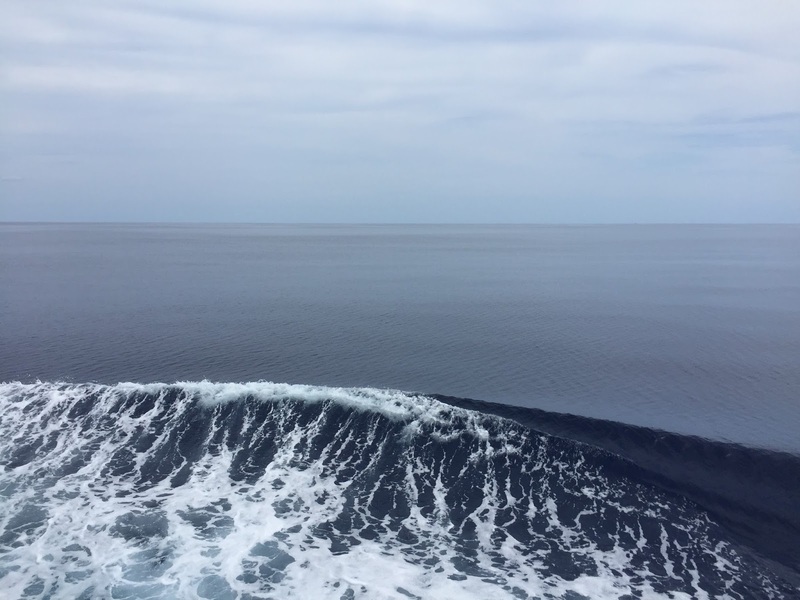 Many of my colleagues say that going out on deck and watching the horizon helps, since it gives you a stable reference point. I like going belowdecks where the pitch and roll are smaller. Apparently ginger also helps, if you can get your hands on some. I’m not sure how true this is, but won’t question it. I just like ginger. The constant motion of the ship affects things beyond seasickness, which is likely to wear off after a day or three. Everything is bolted down; desks, beds, you name it. Things that aren’t bolted down (chests or scientific equipment) are probably tied down with ropes or ratchets. Chairs have rubber feet or some other setup to keep them from sliding. For smaller tools and such there are non-skid pads you can lay out on tables. Doors must never be left ajar, especially those that lead out onto the decks. Those are heavy and can really hurt someone if they swing shut. Case in point, it is a bad idea to clasp your hand around the edge of a door. Good way to lose a finger or four. Most of the interior doors can be left open though, since there are electromagnets on the walls that will prevent them from swinging shut. You wouldn’t be able to pry a door off of some of the stronger magnets no matter how hard you tried! Of course, it’s probably a good idea to keep most doors closed anyways, so as to help with the air conditioning. But never slam a door, since it is generally a safe assumption that somewhere on the ship someone is taking a hard-earned rest, no matter the time of day.